Yes, it is possible to screw up off-roading so badly that the axle on your brand-new Toyota Tacoma actually gets ripped right out from under the truck. Although that video makes it look like an FJ Cruiser is pulling a late-model Tacoma uphill, I believe it’s actually just an odd camera angle and the derelict pickup truck is trying to come down. Regardless, there’s all kinds of hell no happening here. Why are the Taco’s wheels all locked up? Why is somebody pulling with a winch line like that? Why didn’t anyone tell the recovery truck to stop when something was obviously going very wrong underneath the Tacoma? And why do they keep pulling as the pickup truck gets dragged over its own ejected axle? This clip has been floating around the internet for a couple days, but a reader sent in what does appear to be the original upload along with a couple other angles of the senseless destruction. 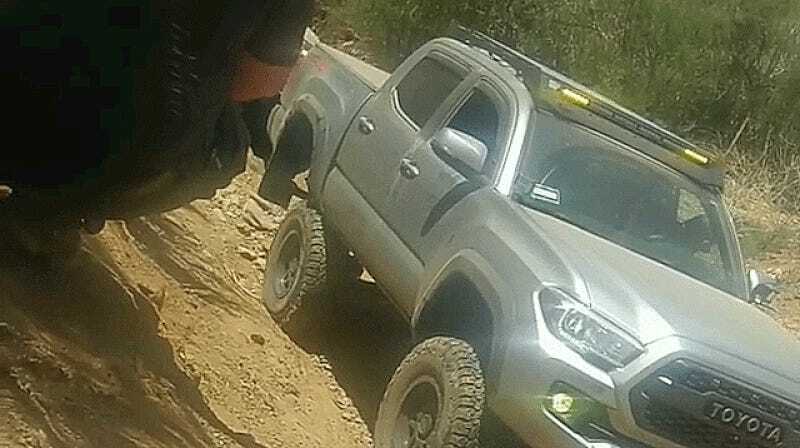 Apparently this poor Toyota got worked over at Rowher Flats, an off-road vehicle area not far north of Los Angeles. As to why the axle was separated in the first place, prevailing speculation seems to be that the u-bolts holding the leaf springs and axle in place somehow broke, leaving just ancillary components like the shocks and driveshaft to hold the rear tube to the truck. And that was never going to last long. Double-check your work, folks. And try not to off-road around people with bad habits. Let's remember the good Toyotas.